John Agnew began his career in natural history museums and zoos where he designed exhibits, produced illustrations, and painted murals and dioramas in the U.S. and as far away as Moscow. In his hometown alone, he has produced nearly thirty thousand square feet of murals and dioramas for the Cincinnati Museum of Natural History and Science, the Cincinnati Zoo, and Cincinnati and Hamilton County Parks. One of John's favorite subject groups is Crocodilians. 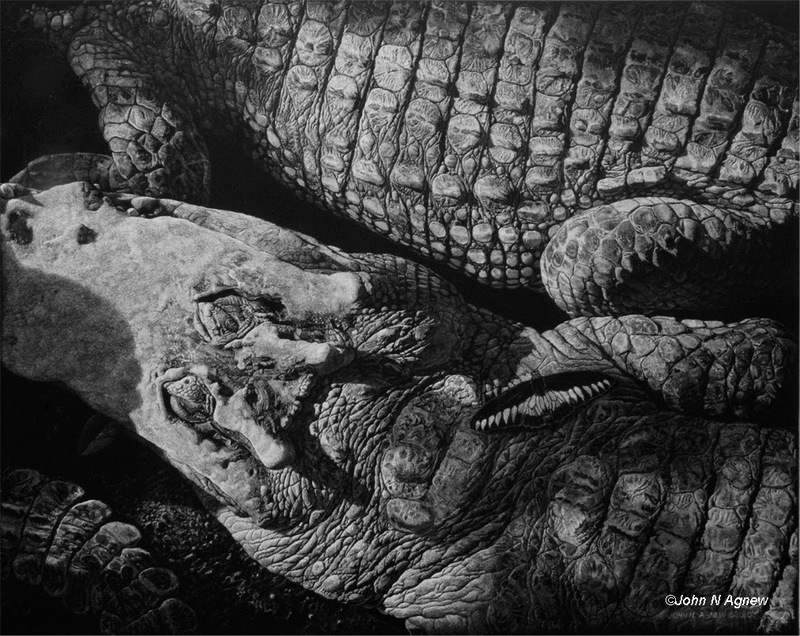 While John works in a variety of media, he most often portrays crocs in scratchboard because it is so well suited to the textures and detail of these pre-historic subjects. 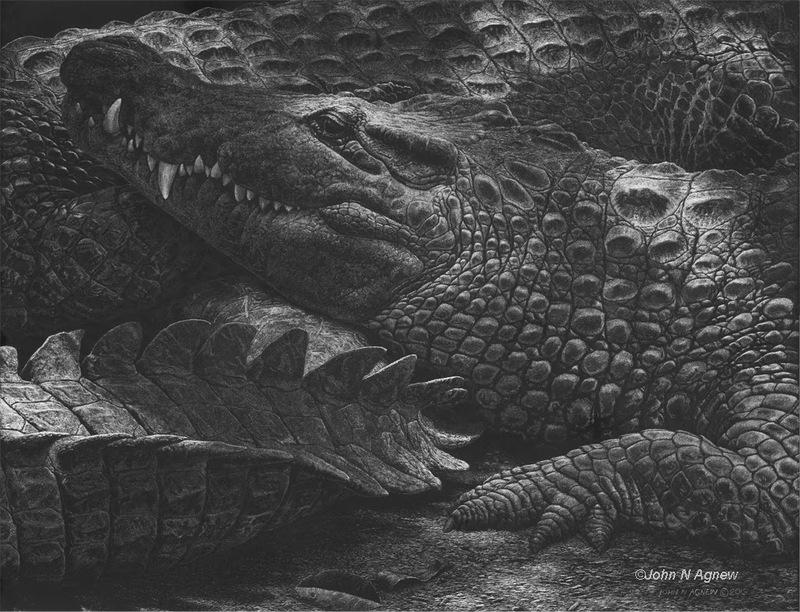 CROCODILIAN SCRATCHBOARDS BY JOHN AGNEW explores crocodilians as studies in texture and form. Agnew likes the scratchboard technique for its affinity to the engravings in early texts about zoology, and its ability to treat the species in exquisite detail. 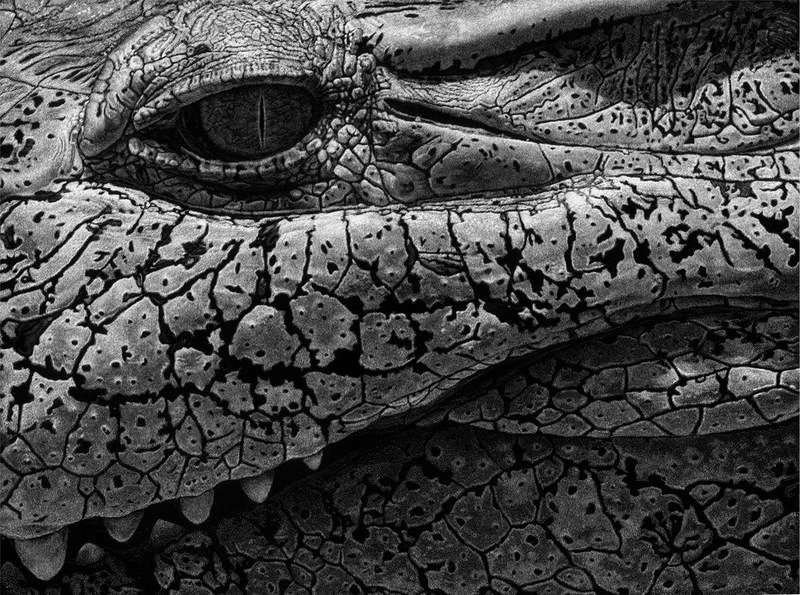 The contrast of black and white lines is well suited for showing off intimate details of a crocodile’s scaly texture. Intimate portraits like those above, plus scenes from daily crocodilian life and even interactions with humans are all subjects explored in this exhibit. In addition to scratchboard, field sketches and paintings of crocodilians and their world-wide habitat round out this exhibit. John has traveled worldwide in search of his subjects, including Borneo, Thailand and the Peruvian Amazon in addition to much of the United States. Among John's many accomplish-ments and honors was his 2011 appointment as Artist in Residence at Everglades. John Agnew's work has been featured in The Artist’s Magazine, Reptiles Magazine, and various other periodicals. In 2001, North Light Books published a book entitled Painting The Secret World Of Nature entirely written and illustrated by John Agnew.